All of the reports came back from the various medical bodies required to respond to the Coroner’s Judgment of Inquiry. 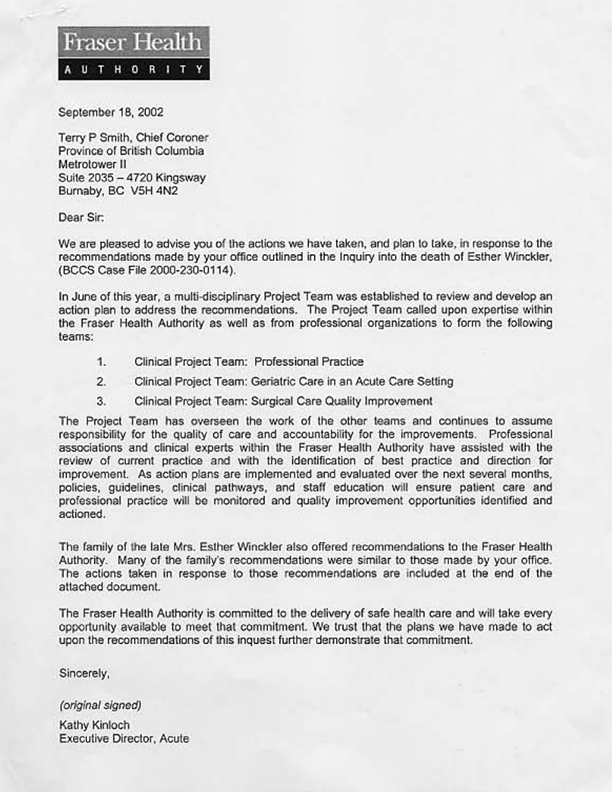 After three years, the family received a letter from the Coroner on March 6th, 2003 with copies of these reports and notification that BCCS Case File 2000-230-0114 was now considered closed. 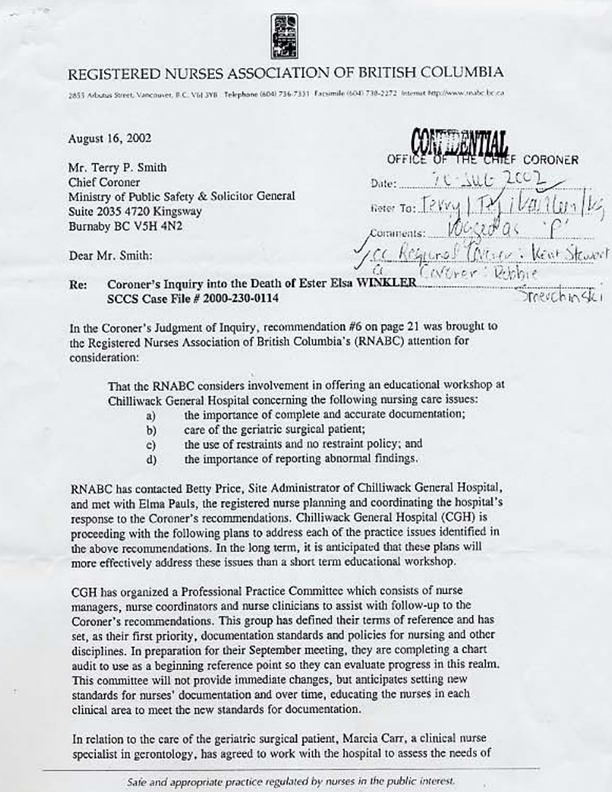 We were heartened that the RNABC were extremely proactive in responding to the Coroner’s findings, made a number of visits to Chilliwack General, and were instrumental in helping to set up a permanent Professional Practice Committee to look at new protocols and procedures, and to encourage education and re-education as needed. Their final Medical Response to the JOI is included above. 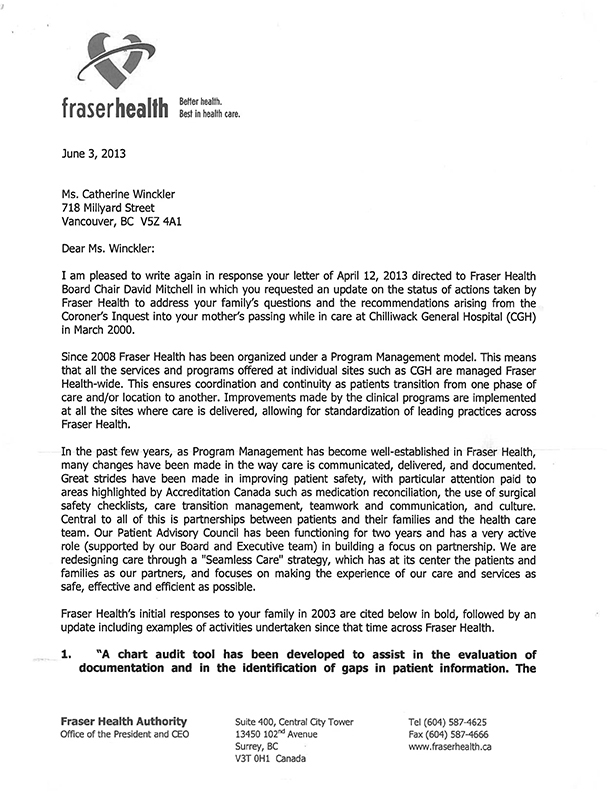 We encouraged the Administration of Chilliwack General Hospital and the Management and Board of Directors of Fraser Valley Health Region (See Letter to Chairman of the Board) to consider some of the recommendations arising out of our personal experience with this particular hospital and were very pleased to receive in writing (June 26th, 2002) the assurances of the then new Chair of the Board of Fraser Health Authority, Barry Forbes, that a “multidisciplinary team has been established to address all the recommendations of the coroner’s report and develop an action plan. This team consists of the medical director, chief of staff, anesthetist, site administrator, and nurse representatives from OR, surgery and medicine and the Quality Advisor. A plan outlining a process to ensue (sp) quality of care and accountability for the improvements is expected to be completed by mid-July and will then be brought back to the medical and nursing staff to be used as a learning tool.” Their final Medical Response to the JOI is included above. 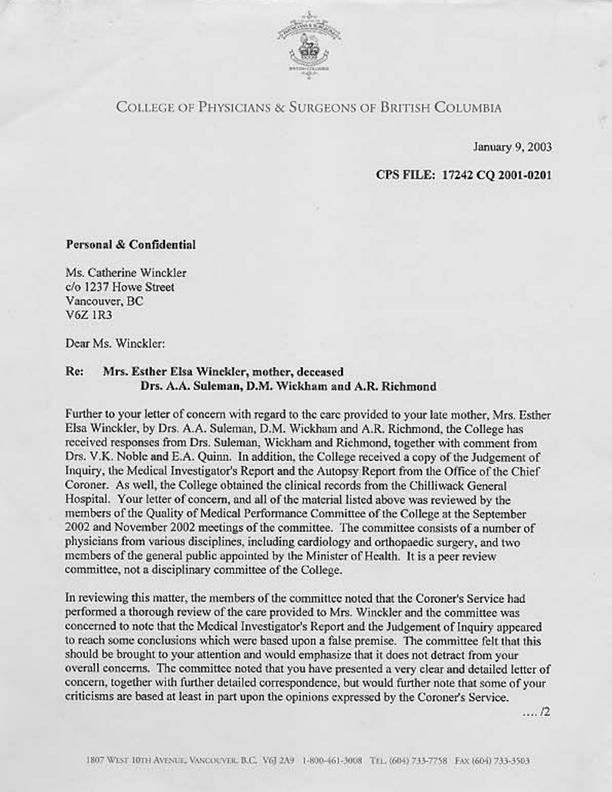 The College of Physicians and Surgeons, while critical of the level of post-op care received by Esther Winckler in their response, gave no further recommendations or reports of follow-up to their membership. See final Medical Response above. As stated earlier, this was incredibly disappointing to our family who requested that we have the opportunity to refute statements of certain of the doctors that were completely contrary to our knowledge, representations made to us prior to surgery, and our first-hand post-op observations. If there was ever ‘anger’ involved in our journey, it would be in this arena where we felt unheard, disrespected, and even marginalized out of the process. One of the gratifying things that came out of the Coroner’s Report was the response of specific members of the health community. We were absolutely overwhelmed by new programs initiated following our mother’s death aimed at nursing. These included the Acute Care Geriatric Nurse Network and the Geriatric Emergency Nursing Initiative (GENI) founded by RNABC clinical nurse specialists Marcia Carr, Phyllis Hunt, and other talented nurse change-makers whom our family now considers friends. GENI began as a collaborative group of 12 Clinical Nurse Specialists in Geriatrics, Orthopedics, and Rehabilitation who received provincial funding, and provided the learning opportunities and support to grow a network that has now extended to over 3,000 Registered Nurses and Licensed Practical Nurses. Read more in the December 2004 issue of Nursing BC, in the December 2, 2004 Vancouver Sun, and in an excellent follow-up story in Fraser Health’s infocus magazine, Winter 2009, called ‘Dying to be Heard.’ We are very grateful for these efforts and feel that this is truly a legacy to our mother, herself a lifelong educator. The recap they sent was comprehensive and much appreciated by our family – evidence that our mother’s death had some very really impact on quality of care issues. See the full response below.